How magnification works?, the principle of magnification is clearly displayed in this school science animation. 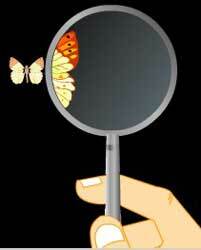 What is a magnifying glass ? A glass used by everyone for burning paper in at kid's age is a large convex lens commonly used to examine small objects. What is the use of magnifying glass ? How a magnifying glass works? Rays from the object after passing through the lens converge at the observer's eye .The lens bends incoming light so that an enlarged, virtual image appears at the observer's eye. What is the nature of the image formed by magnifying glass? The image so formed is magnified and virtual. Ans: The light from a flashlight and a candle is too weak to burn a paper, for Sun it depends on the time of the day, thickness of paper, ambient temperature etc. normally sharply focused image of sun at 33 deg C at 13:00 hours took around 7 seconds to burn a hole in 60 gsm paper, while 70 gsm white photocopy paper took 11 seconds to burn a hole. Ans: The cost of the animation is given in the downloadable files pricelist in the download section, but changing the text from english to turkish is not possible. Ans: BCC is commonly found on the nose and eyelid, and the mostly in fair skinned people who have less melanin, and freckle or burn rather than tan. Sunglasses may not have caused this as high energy UVB, the primary agent responsible for sunburns can’t penetrate glass, also dark glasses cannot focus light on to a point. In addition, BCC grows slowly and is painless but can be caused by radiation damage. So most likely,the sensitive skin of nose was damaged due to direct UVB exposure not sunglasses. Ans: Do you mean temperature? This is found by calculation rather than measurement, will need to calculate energy , sun's power on the surface of the earth is about 1200 W/m^2, calculate area of lens and sunrays intercepted. Aberrations causing defocusing of the lens (removable by using compound lens), emissivity of the surface and the conductivity need to be known, also account for 4% Fresnel reflection loss off the surface of the magnifying glass. Use Stefan-Boltzmann law to calculate temperature. Ans: Theoretically, it will, but since the glass plate’s radius of curvature is very high, the magnification will be very low, it will serve as a weak lens. Ans: The Fresnel lens is a powerful concentrator as it captures 85% of incident light compared to 20% for ordinary lens. It can concentrate 20 times to 400 times depending on its type and is used in solar furnaces. It produces extremely high temperatures in a small area. For ambient temperature of sunrays of 25 deg C, it can produce a temperature of 500 deg C (M =20). A medium temperature solar thermal concentrator produces heat around 100~250 deg C while a high one will around 1500–1800 deg C.
Ans: The time taken for burning depends on a) material b) sharpness of focus c) ambient temperature d) angle of the Sun e) color of the material, for example in our experiment a blue carbon paper with sharply focussed image of sun at 33 deg C at 13:00 hours took around 7 seconds to burn a hole, while 70 gsm white photocopy paper took 11 seconds to burn a hole. Ans: Their origination lies in a blurry and unrecorded past, probably transparent crystals with a thicker middle part were discovered to magnify objects, or burn materials using Sun. These were known as “burning glasses”; Greeks in 448 BC and Romans in 1st AD have recorded their use. Nero in AD 50 used emerald for watching games. In 1st Century AD glass was invented by Romans and used as a lens. In 1268, Roger Bacon, wrote the first scientific literature describing them for vision correction. Ans: Distance makes a difference, it has to be at a its focal length to focus all rays onto a single point to achieve quick burning, at any other distance the rays will be diffused and the burning may not occur or if it occurs will take a long time. Ans: Magnifying glass can focus sun's rays onto a point and can produce intense heat, about 1,000 watts per square meter of Sun's energy filtered through atmosphere reaches us, imagine focusing half of that onto a few mm of space and you can burn a leaf of paper with it, thin plastic may burn but the amount of heat and time required to burn thicker plastics like a water bottle may be more, refer burning with magnifying glass animation on our site. Ans: Depending on the weather conditions, intensity of sunlight, focal length of convex lens and thickness of paper it takes from less than 10 seconds to upto 30 seconds burn a hole in the black paper, we have not been able to experiment out with other colors but will do that soon and publish the findings, but if you could do that we will publish yours with credits. Ans: Dark colors will burn faster than light colors; Black will burn the fastest, the paper appears black as it is absorbs the light radiations (light energy ) completely while other colors reflect back some part of light , the energy of the absorbed radiation is partly used for raising its temperature and partly used for emitting longer wavelength infra-red radiation, since it absorbs more energy its temperature rises fastest and it burns fastest.